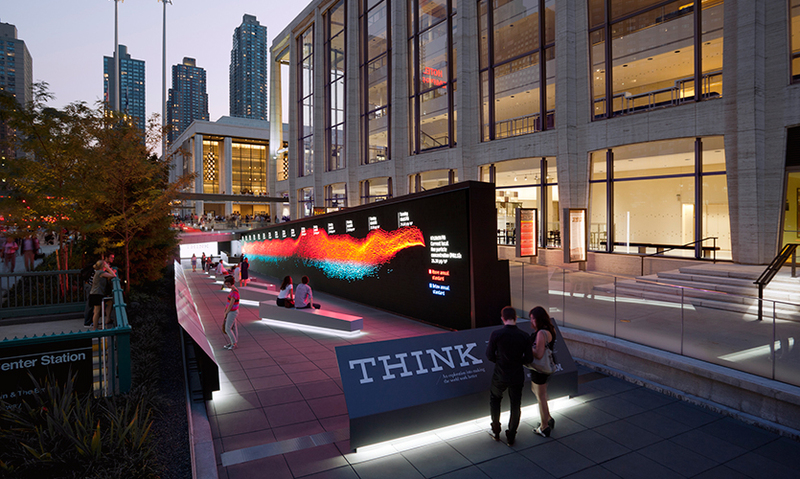 A cornerstone of IBM’s centennial year celebration, THINK was a multimedia exhibition that brought to life the many ways in which people are making the world work better through innovation. 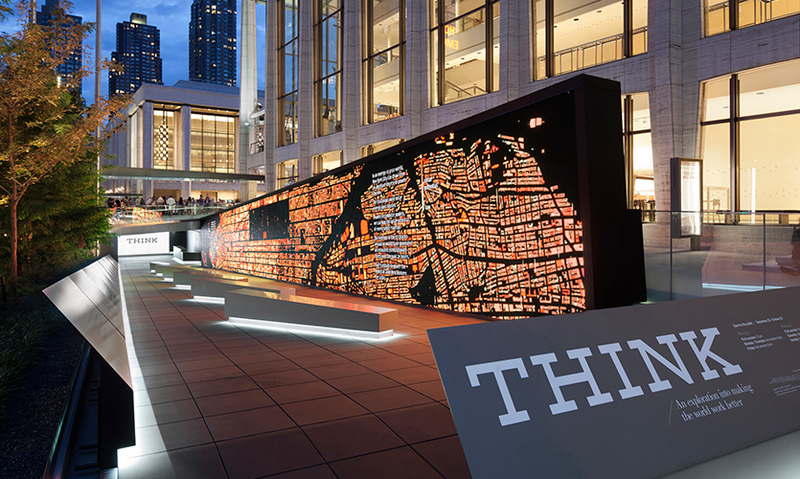 It was free to the public, drawing 25,000+ diverse visitors—from CEOs to school kids—in its month-long run at NYC's Lincoln Center. 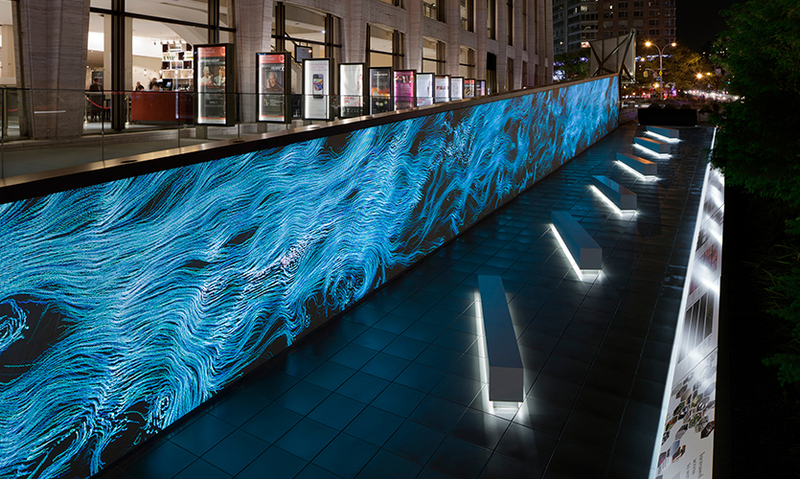 A 123-foot-long LED wall attracted visitors with color, animated patterns that visualized real-time data from local sensors, and live feeds from government agencies and academic institutions about water consumption, solar energy, air quality, traffic congestion, and commerce. As visitors walked along the wall toward the exhibit space, they discovered how we can now see and measure change, waste, and opportunities in the world’s systems. 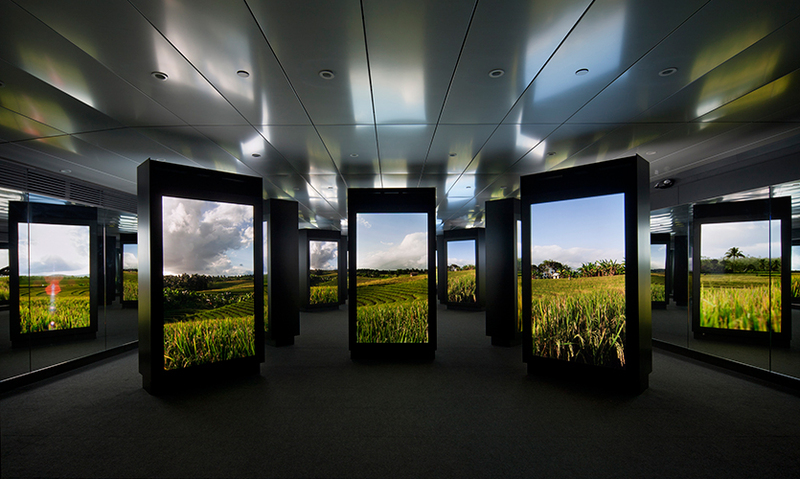 The exhibit space presented a dynamic display of 20 two-sided, 8-foot-tall media columns arranged in a field of viewing clusters. 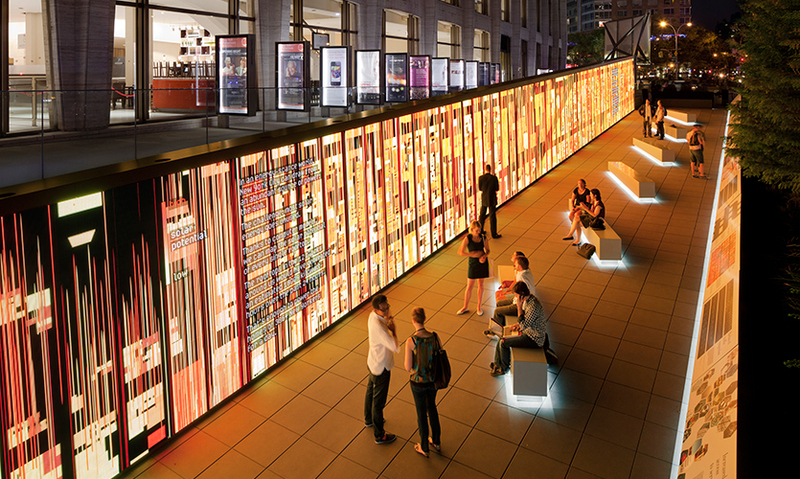 The columns supported 40 85-inch plasma screens that served dual functions as displays and touch interactives. 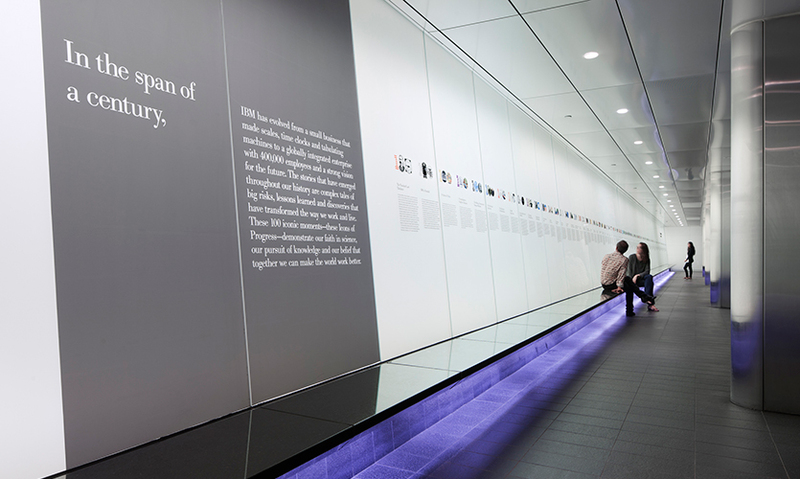 Housed between two 100-foot mirrored walls, this 3,000-square-foot field of media extended into infinity on both sides. 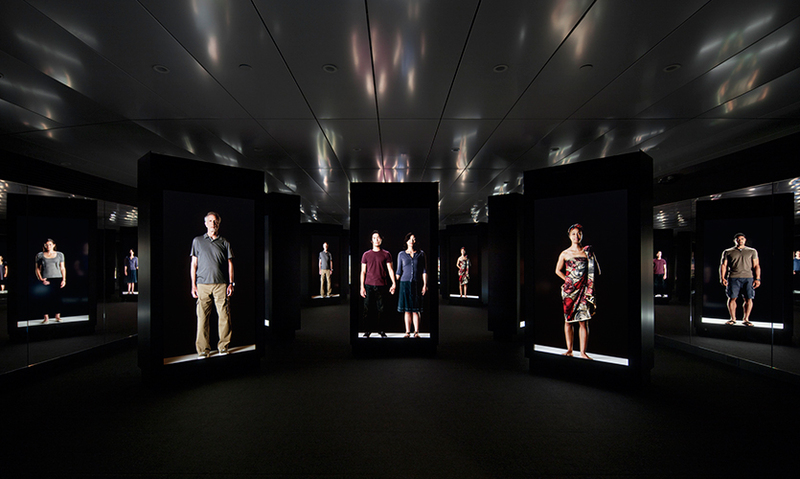 The film component of the theater experience was a 10-minute exploration into the pattern of technological progress. Filmed with a custom-built three-camera system, it was a stunning visual experience that touched on stories of advances in medicine, agriculture, and traffic sensor systems. 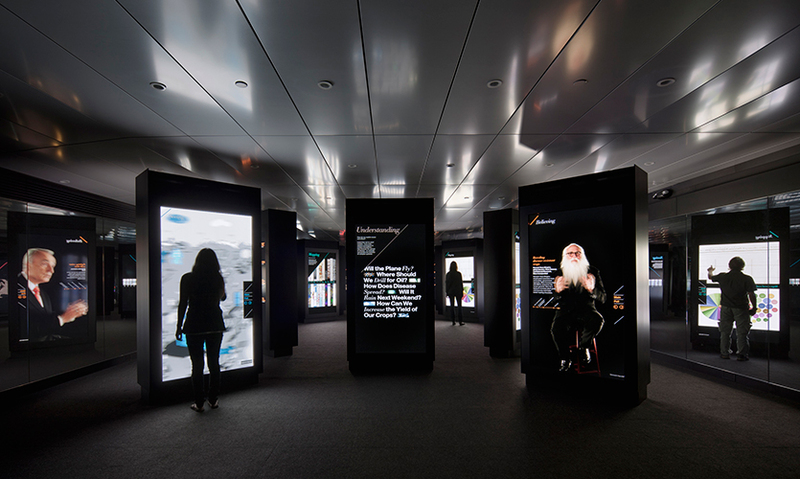 When the film ended, each of the 40 screens became interactive touchscreens, allowing visitors to actively explore and seek deeper insights into the ideas, initiatives, tools, and techniques that promise real ways to make our world work better. THINK was inspired by IBM’s 1964 World’s Fair Pavilion, which ignited widespread interest in computing and set the stage for the technological revolution. Just as the pavilion demystified the complex scientific concepts of that era, THINK aimed to define today's conversation about technology.